Come Jump on a City Tour with us to cruise through some of the 15 BEST City Highlights including Union Square, Chinatown, North Beach, Pacific Heights/billionaire's row, Golden Gate Park, the Haight/Ashbury, the Castro and The Marina. Also, you get 7 stops for photo ops at landmarks such as The Golden Gate Bridge, Painted Ladies, Palace Of Fine Arts, Twin Peaks, The murals in the Mission, Civic Center and Lombard Street ( shhhh ...On occasion you might see us driving down that crooked Lombard Street if traffic permits) FUN FUN FUN!!! 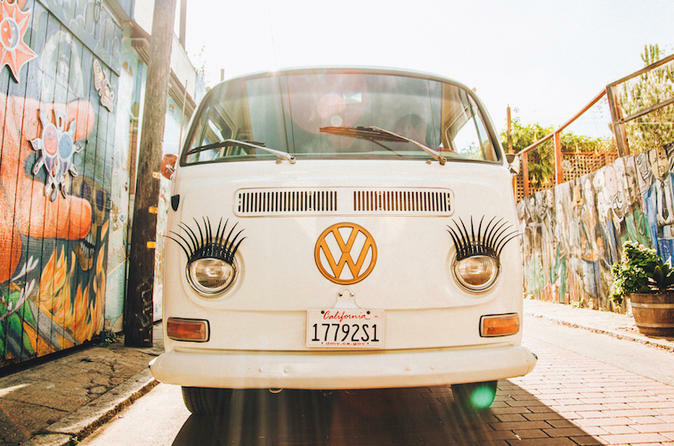 Start your tour with a pick up in a vintage Volkswagen Bus at either Fisherman's Wharf or Union Square, your choice! Enjoy sightseeing and photo shoots as we explore Lombard Street, Union Square, Chinatown, North Beach, the Marina, the Palace of Fine Arts, the Presidio, the Golden Gate Bridge, Fort Point, Golden Gate Park, Alamo Square, the Haight, Twin Peaks, the Castro, the Mission, and Civic Center! Enjoy a small group tour in a vintage Volkswagen Bus. Enjoy complimentary snacks and water, as well as beer and white wine for afternoon tours.